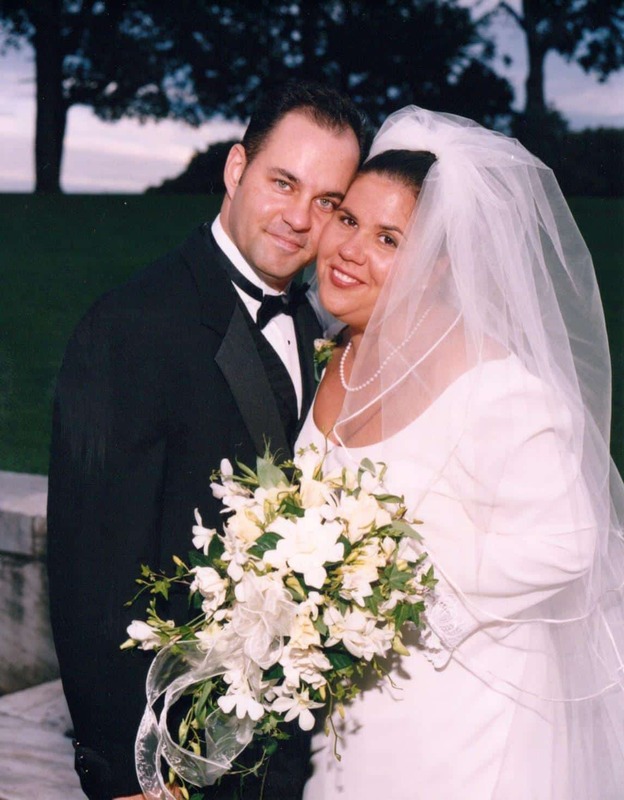 Nicky and her brother, Raymond, on her wedding day. Growing up, I was the little sister that was dragged around to the early morning hockey practices. Each weekend, I dutifully went with my dad and big brother to hockey games and morning scrimmages. From Mites, Peewees, Squirts, Bantams leagues and so forth, I sat through it all that Providence Youth Hockey League had to offer. I knew more about the game of hockey than half of the boys on the team. At one point my dad became a coach, and therefore I became my brother’s unofficial equipment manager. I knew how to tape sticks, keep shin pads in place and most importantly the tricks to keeping the skates tightened and laced. I am not proud to admit the fact that I have seen the insides of far too many locker rooms, and have never forgotten the perfumed aroma that emanates from within the walls of those rooms. Luckily I was too small to carry my brother’s hockey bag after games and practices, but because there were extra hands around that usually meant that I got to carry the hockey sticks. It seemed like my brother Raymond played hockey forever. He was good at it, a natural athlete. Despite his natural speed and sinewy build, he preferred to play defensive position on the ice. He liked to score goals, but had a gift of being able to skate backwards quickly so he was always placed by the net. He later admitted that the wing and center positions worked much harder than he did, and they skated more too. But he was happy guarding the net and being a defensemen was a position that suited him. When he wasn’t on the ice, he and his friends liked to play street hockey. And yes guess who got stuck in net, yours truly! Raymond decided he would help get me dressed for my newly appointed position as goalie, it was the least he could do being the loving big brother that he was. He duct-taped foam rubber pieces to my legs (mock pads), he gave me his hockey helmet and 1 glove, his baseball mitt (to catch), chest protector and a goalie stick. I was dressed and ready to play! I was a vision of loveliness in the net. It was only after a few shots to the facemask did I learn to catch the puck or let them score on me. I admit I became a decant goalie, I survived in the net and fiercely protected my goal crease. I could jab and deflect like no other little sister in the neighborhood could! However, my hockey career was short lived. When my parents came home to see their princess shoved in the net while my brother and his friends practiced taking slap shots at me, they were not happy! I was banned from playing goalie. My parents made sure that my brother heard the message loud and clear “don’t stick your little sister in the hockey net and practice taking slap shot against her”! On occasion I would play a little street hockey with Raymond, it was just he and I shooting pucks. That was always fun. I eventually developed a decent wrist shot, and according to my brother I had ok aim for a girl. Proudly, I still can take wicked wrist shot on a hockey net. It is a skill that I carried over with me into adulthood. I am not sure what I can do with it now, but I know that it is something that makes me unique. Despite the long days spent at the hockey rink, there was always the reward of coming home snuggling on the couch and watch TV. This was very appealing to me, especially during those cold winter’s days in New England. My dad would usually cook dinner during hockey season. My mom worked, so my dad would help out with the cooking. Dad made a dish that my brother and I just adored, Shepard’s Pie. Honestly, it is a wonderfully simple comfort food that consists of seasoned browned hamburger, mashed potatoes and corn. Put it all together in layers in a baking dish and heat it in the oven. My dad would serve it with some brown gravy, and my brother and I would eat it with a drizzle ketchup on it. The aroma of this dish baking in the oven would fill the entire house. Eating a piece of Shepard’s Pie, hot and fresh from the oven was amazing. It was simple and unadulterated in taste, comforting warm goodness on a plate. We ate this for years while we were growing up. It is a dish that would remind me of those days of coming in from the ice rink and hanging out with my brother. Raymond no longer plays hockey, those days are long gone. His athletic built has given way to a more comfortable, rugged spread. He and I will joke about eating and making the Shepard’s Pie. We now are the ones who make it for families; another generation will enjoy this gastronomical delight. I have never lost my love for hockey, nor my passion for a good Sheppard’s pie. Needless to say several years ago, I was thrilled to see that two of my favorite things had come together in a cookbook. The Pittsburgh Penguins had put out a cookbook 2007 called Goal Scorers & Gourmets. Being a hockey fan I knew that I had to get a copy, and I was glad that I did. Players, coaches and staff contributed recipes for the cookbook. There was also little bits of foodie facts about each of the players as well. As a tradition, we try to make Shepard’s Pie for dinner on the night of the Pittsburgh Penguins home opener. It is great way to kick off the season and keep the connection between Shepard’s Pie and hockey going. For me this dish will always remind me of my childhood, my days spent at the ice rink and my time in the goalie net. I have included my recipe for my Shepard’s Pie, I hope that you like it. 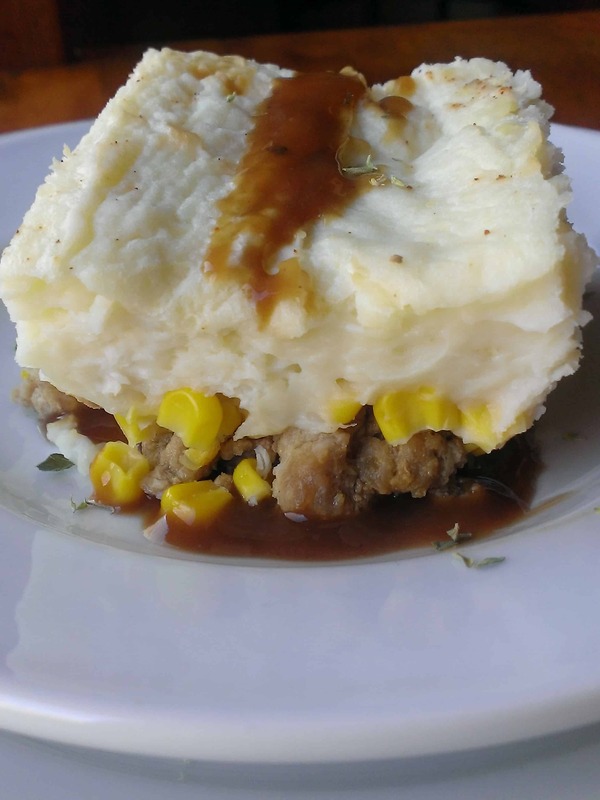 Shepard’s Pie has many variations, so you can be creative with your ingredients. Peas, corn or carrots seem to be the standard vegetables. The ground meat can vary from lamb, beef or turkey. The mashed potatoes can be plain, or as dedicate as you like. Some potatoes are mashed with cream cheese or sour cream and then topped off with cheddar cheese. This is a very forgiving dish, so have fun with it. In a skillet, add 1 TBSP of olive oil to a medium heat. Add the onions and sauté for several minutes- until the onions become soft. Add the ground beef and cook until done, season to taste with salt and pepper. Drain of excess fat and put the cooked beef aside. In another pot, add the cut potatoes cover them with water and boil them until they are fork tender. Drain them and mash the potatoes, adding the butter and milk until smooth. Season to taste with salt and pepper. Spoon meat mixture into a 9×13″ baking pan. Top with the corn, spreading across the meat mixture. Add the mashed potatoes over the top. Put in a 350F oven, and bake for 30- 40 minutes or until top is lightly brown. Nicky D Cooks is the owner and operator of Nicky D Cooks—Authentic Handcrafted Italian Biscotti and Pizzelle.